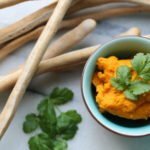 Roast Carrot & Cumin Dip, Breadsticks & A Free From Christmas | The Free From Fairy. This year, I’ve teamed up with some incredibly talented bloggers to create a free from Christmas buffet without any of the top 14 allergens. We want to show that it is possible to cater for everyone at Christmas, removing the stress for those with allergies and for those catering for them. So, during the course of the next two weeks you will be given a simple recipe to sit on your Christmas buffet table by each of the bloggers involved in the challenge. 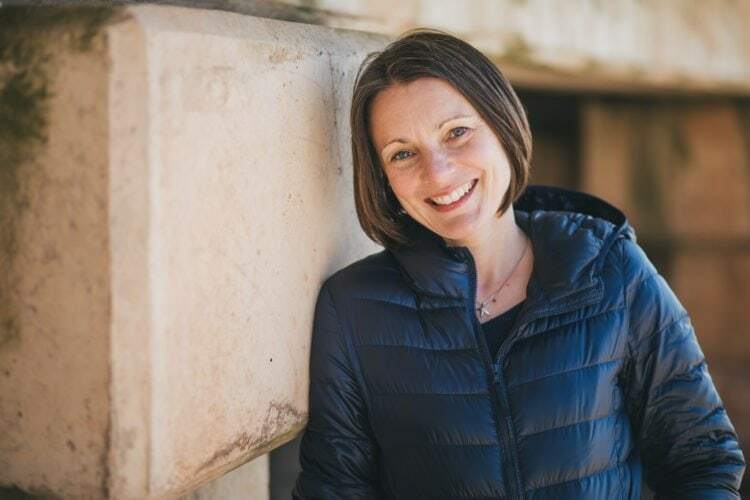 Mel, over at Le Coin De Mel kicked off proceedings yesterday by sharing her recipe for chicken brined in gin (yes you did read that correctly, and having tried this amazing way of preparing chicken at River Cottage recently I can assure you it is divine). Tomorrow you will find another very free from recipe suitable for a Christmas buffer over on The Intolerant Gourmand’s blog and she will direct you to where you will find the following day’s delights. Within the next two weeks you should have enough dishes to create a feast fit for anyone, without having the worry about the dreaded ‘dietary requirements’, allowing you to relax and have fun at your Christmas gathering. 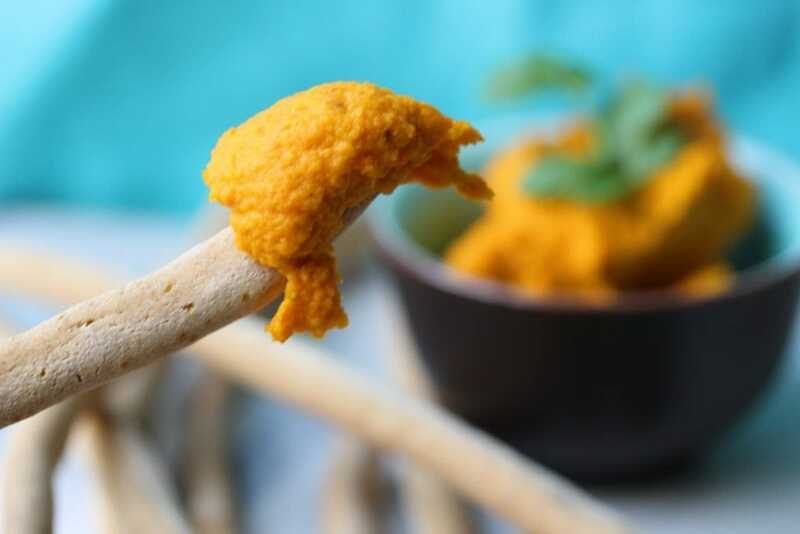 So without further ado, I’m going to crack on and tell you how to make my roast carrot and cumin dip with accompanying breadsticks…two recipes in one you lucky folk! Tip number one…don’t over work the dough for the breadsticks. Once it has come together in a dough, shape it and bake it. The kids made the last lot and spent quite a lot of time working the dough…the result was a drier dough that subsequently cracked upon baking. Tip number two…double the breadstick recipe, triple the recipe, quadruple the recipe…depending upon how many people you are feeding. As always, I have made a small amount in this recipe (around 10 breadsticks) because they are best eaten fresh. At the end of this challenge I will write another blog post directing you to all the fabulous recipes created for our virtual free from Christmas buffet table…just in case you miss any. In the meantime try out my recipe. I’m sure you won’t be disappointed…along with being great on a buffet table this is the prefect mid-afternoon snack for when your kids get home from school. Find out where you can buy my wholegrain gluten and rice free flour blend here. If you share this recipe be sure to use the #FreeFromChristmas. You’ll find all the recipes by searching on that hashtag! Pin the recipe in Pinterest so you don’t loose it. Why not create a board for free from Christmas buffet foods to save all the recipes to? I can’t answer whether the breadsticks keep…they get eaten before I can tell you! But in an airtight container they should be fine. You could always leave them in the cooling oven to really dry them out? Fab! This challenge is perfect for you then! Oh my goodness, I am ridiculously excited about your breadsticks. 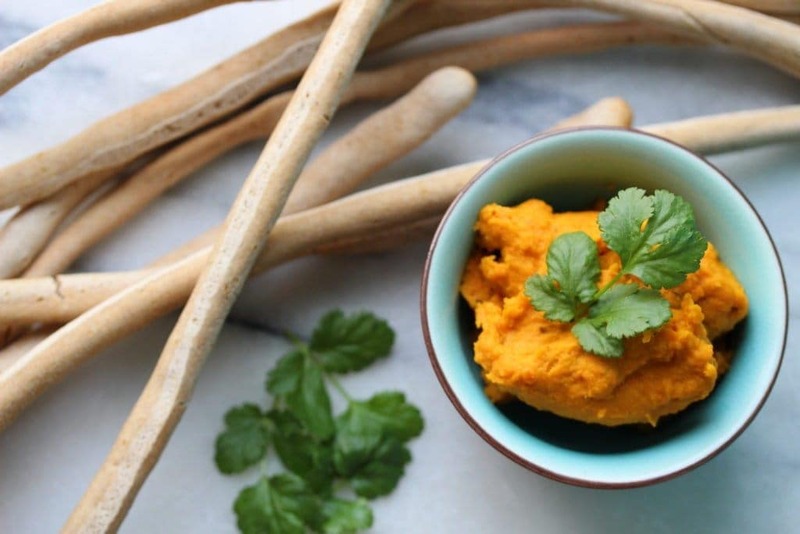 They look so easy to make and they’re Jumpy’s favourite snack with houmous. I have houmous in the fridge so I’m definitely making them tomorrow or on Saturday. Although she loves Schär’s breadsticks, they’re a special treat as they’re so expensive. Making them at home is the answer! You know what? I’d never even thought of making my own. 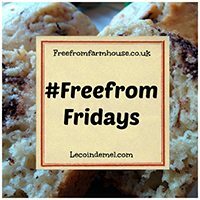 Loving our #FreeFromChristmas already! They are super simple and she’ll love making them too! Just don’t let her handle the dough toooooo long (like I did with my kids) or you’ll have cracked breadsticks (still taste good though)! The dip looks scrumptious and the colour is very inviting. I wish I could have this as a snack right now, Chloe. Thanks Chloe. They are really simple! Wow! That Dip is incredible! LOVE it! such an amazing colour and roasted carrot? Yum! The breadsticks look gorgeous too. Wow these look so good! 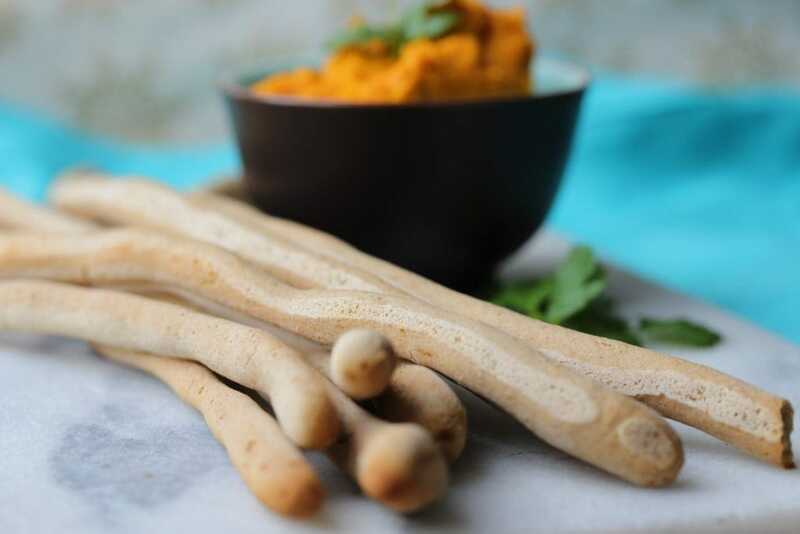 The breadsticks look amazing and that carrot dip sounds divine! One on my list to try for Christmas! 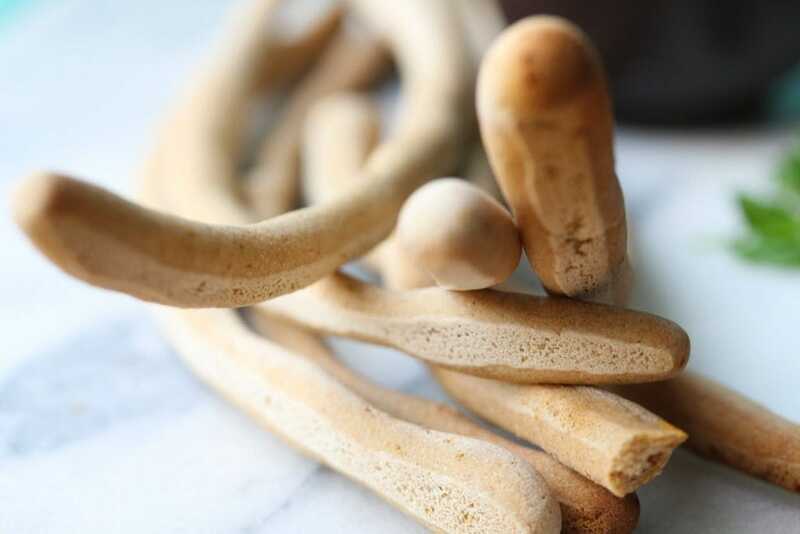 Those breadsticks…they look as though they have the perfect crunch! Love the sound of the dip too…definitely going to try these recipes. Really love the carrot and cumin dip. I couldnt get your self raising flour so used an alternative. Sadly I was sure not to over work the dough , but when rolling in the palm of my hand the dough kept breaking and was crumbly .. when cooked they were really tough inside a bit like chewy pasta. Such a shame will continue to seek out your flour. But I love your dip and will be making this over Christmas. Thanks Vicki even my husband was convinced and he hates vegetables. Hi Teresa, sorry you couldn’t get my flour. Yes, if you make it with other flour blends it would be different. So glad you like the dip though. I know Amazon have got the SR in stock as do Tabl… Have a fabulous Christmas.